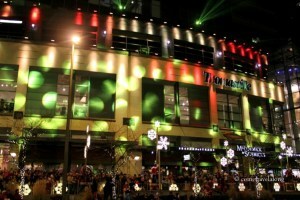 With the Thanksgiving day coming in and the Snowflake Lane opening next week in Bellevue, I wanted to share our memories of this event from 2013. As Christmas is close by I thought of sharing a post indicating the spirit of this festival. 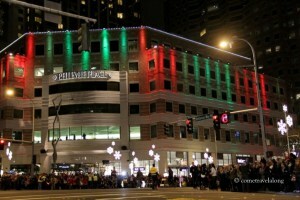 Snowflake Lane is one of the most beloved holiday event in the Seattle area. 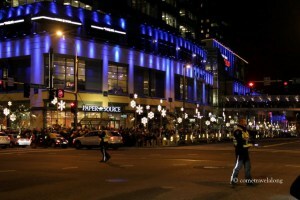 It takes place in Downtown Bellevue where each night, from the day after Thanksgiving through Christmas Eve, the bustling streets are magically transformed into an extravagant winter wonderland; featuring falling snow, twinkling lights, enchanting winter characters and lively musical dance performers. These pictures are from last season’s parade. We went in early to grab a good spot as the street gets very crowded with families specially of children. The traffic is rerouted during the parade time and people are cordoned at many areas of the street. We managed to find a place in the front row of the sidewalk. So nice to see you back after a long gap. Beautiful pictires as usual. Though I am not regular yet and miss blogging and all the blogger friends. Thanks Carl! The year has been going on fair for me. Hope all is well with you too.